Every once in a while we like to turn our kitchen into a burrito factory. And by this I mean we basically set up an assembly line operation and make make enough burritos to feed a small army, or last us for lunches for a long, long time. On this latest occasion we made 31 burritos. 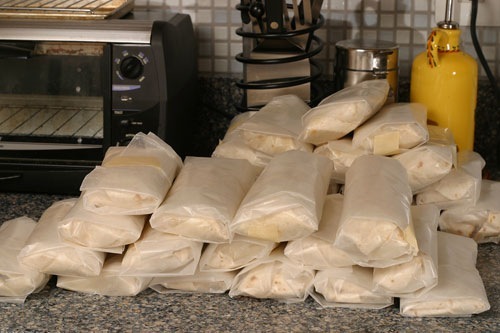 We wrapped them individually in wax paper, taped them closed with masking tape, and put them in the freezer. They are a quick lunch to take to work when there is nothing else in the house. A minute and a half in the microwave is all it takes to heat up. We made a mix of steak and chicken burritos. You can really add any ingredients you wish to these burritos. We did rice, corn, refried beans, cheese, salsa and meat. First you’ll want to cook/prepare all the ingredients. To give your rice a little extra kick, after it’s cooked, add some lime zest, juice from a lime and chopped cilantro. Cook the meat using good flavors and seasons; blacken the corn on the stove. First place all the junk in the middle. Place some refried beans on the top. It will work like glue and “Seal the deal.” Technical cooking term. Fold the left and right side in so the fold is right at the start of the “junk” in the middle. 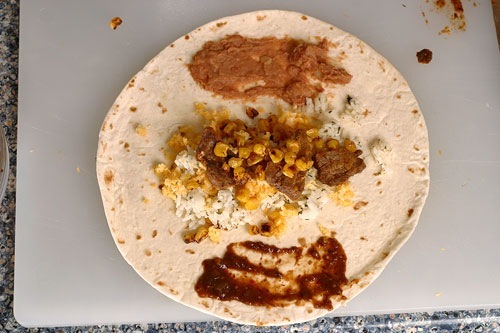 Fold the bottom up, overlapping the junk and then start rolling the burrito closed. great idea! you must have a huge freezer, though? They actually stack up pretty well. If you have a fridge at work, you can stock a few there too.